The overarching focus of this project was to explore experiences of people with early-stage dementia (living independently) taking part in urban forest activities. Understanding mental wellbeing and issues of identity underpinned the work. Participant (with ranger) making a bird box. The research aimed to engage with, and seek to improve, forest management approaches that are key to achieving the Forestry Commission and Scottish Government’s agenda of improved mental wellbeing and social inclusion. Co-production between the researcher (Dr Mandy Cook, University of Dundee), Forestry Commission Scotland, Alzheimer Scotland, third and public-sector organisations and individuals with early-stage dementia ascertained that the use of urban forests can contribute to care and support by enhancing positive mental wellbeing and broadening social networks. In 2017 approximately 93,000 people were living with dementia in Scotland (Alzheimer Scotland, 2017). Scotland’s National Dementia Strategy (2013-16) asserts that dementia is one of the foremost public health challenges in the UK, and in Scotland the number of people with dementia is expected to double by 2031. The cost of dementia care is also high (£26 billion in the UK) and predicted to rise due to this increasing prevalence and decreased availability of family carers. One of the main challenges set out in the Strategy is the need to offer care and support to people with dementia and their families and carers in a way which promotes wellbeing and quality of life, protects their rights, and respects their humanity. Methods used included a literature review, key informant interviews, in-depth interviews, site surveys and semi-structured interviews. A participatory action research approach was used to capture and explore the experiences of an all-male group of people with early-stage dementia who engage with woodlands and forests. These experiences were then used to co-design a 10-week programme of activities based in Callendar Wood, Falkirk, for people with early-stage dementia. 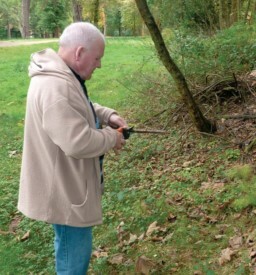 Methods used to collect data from the pilot woodland activity programme included observations and interviews with participants (people with dementia and their family member carers), as well as facilitating staff (including rangers and health professionals), at the end of the 10-week programme. Activities were facilitated by rangers and included woodland walks, bird box building, tree planting, nature photography, willow sculpting, bird and tree identification, fire lighting and woodland cooking. Walk-along interviews were also used as a way of understanding urban forests and participant’s experiences of them. As an aid to these, additional creative methods, including participatory mapping, photovoice, sketching and poetry, provided other ways, besides language, of understanding how use of urban forests shapes a person with dementia’s behaviour and wellbeing. ‘All I have to do is breathe in and out and put one foot in front of the other’ (participant with dementia, aged 68). The pilot woodland activity programme has been shown to promote positive mental wellbeing for people with early-stage dementia, and in particular, the importance of the woodland activities as confirmation of self (Olsson et al., 2013; Sabat & Harre, 1992) was highlighted. The programme provided a sense of escapism and a return to nature that was a welcome release from day-to-day activities. ‘I enjoyed it thoroughly and missed it when I wasn’t there’ ‘I would’ve liked to have been there all the time’ (participant with dementia, aged 66). The findings support research by Phinney et al. (2007) who show that through doing, people with dementia find their lives to be meaningful. ‘I was learning and that was a really good thing about it, I was learning’ (participant with dementia, aged 52). Participants in the woodland programme took part in a variety of activities. Through their involvement in these activities, they found meaning in the pleasure and enjoyment they experienced, in their feeling that they still belonged in the world, and in their ability to retain a sense of autonomy and identity (Phinney et al., 2007). ‘I didn’t feel like the village idiot anymore’ (participant with dementia, aged 62). The value of a meaningful, purposeful sensory experience featured strongly under the theme of connecting to nature – participants spoke about the rain, the crackling campfire, woodland smells and bird song. ‘As we walked there was always something to discuss, the different plants, animals, birds…a way to reach somebody who appears to be locked in with dementia’ (participant carer, family member). The woodland environment also promoted a strong connection to the changing seasons, and stimulated memory and reminiscence. Throughout the programme, participants were given the opportunity to demonstrate skills and knowledge, which allowed the relationship with the rangers to grow to be more of a partnership between workers (Robertson et al., 2013). The group developed a camaraderie similar to the Age UK ‘Men in Sheds’ project (Ballinger et al., 2009), and gave the men an alternative, more appropriate option, than the traditional day care provision. The woodland activity programme is regarded as a complementary intervention, which could enhance services, such as cognitive stimulation therapy, for people with dementia. With the prevalence of dementia expected to continue to increase for many years, it is well worth having alternative, more holistic services which are adapted for people with dementia of varying ages, with diverse interests, likes and dislikes, and from many different backgrounds and geographical locations. If a person with dementia wants – and is able – to engage with tree, woodland and forest environments, it is important for them to have support from families, friends, green space and health-care staff to help them to do it, either individually or as part of an organised, supported group activity such as a woodland activity programme. 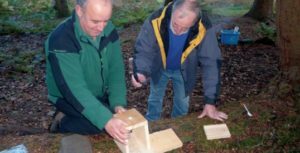 As a result of the findings from this project, the Forestry Commission Scotland plans to roll out the woodland activity programme to new locations in the future. The Economic and Social Research Council and the Scottish Government funded this project. Forestry Commission Scotland supported the research. Alzheimer Scotland were pivotal in helping to support and promote the pilot woodland activity programme through their network of community based Dementia Link and Support Workers. Kevin Lafferty, Forestry Commission Scotland or Mandy Cook. Ballinger, M.L., Talbot, L.A., & Verrinder, G.K. (2009) More than a place to do woodwork: a case study of a community-based Men’s Shed. Journal of Men’s Health, 6(1), pp. 20-27. Olsson, A., Lampic, C., Skovdahl, K. & Engstrom, M. (2013) Persons with early-stage dementia reflect on being outdoors: a repeated interview study. Aging & Mental Health (published online). Phinney, A., Chaudhury, H. & O’Connor, D. (2007) Doing as much as I can do: The meaning of activity for people with dementia. Aging & Mental Health, 11(4), pp.384-393. Robertson, J., Evans, D. & Horsnell, T. (2013) Side by Side: A workplace engagement program for people with younger onset dementia. Dementia, 12 (5), pp. 666-674. Sabat, S.R. & Harre, R. (1992) The construction and deconstruction of self in Alzheimer’s disease. Ageing and Society, 12, pp.443-461. PreviousDoes outdoor recreation with family promote subjective wellbeing?